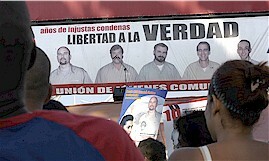 THE youth of Cuba have called on all people of goodwill in the world to continue the fight for justice that the empire is stubbornly denying the Cuban five, imprisoned in the United States for combating terrorism since 1998. At the Flag Memorial of the José Martí Anti-Imperialist Tribunal in front of the Havana Malecón seawall, the call was issued during a concert highlighting truth silenced and innocence made prisoner, which brought together hundreds of young people at that monument to the victims of 50 years of terrorism against Cuba. Luis Morlotte, president of the Hermanos Saíz Association of young creators and artists, recalled what José Martí said: "As long as justice has not been won, the fight continues" and affirmed that that is the conviction which prompts hundreds of thousands of men and women all over the world who are standing up to demand freedom for the Five. He noted the central role of youth in this crusade of solidarity and thanked eminent figures and organizations for their support in denouncing the colossal injustice committed against Gerardo Hernández, Fernando González, Antonio Guerrero, Ramón Labañino and René González. Meanwhile, Morlote said, thousands of Cuban children and young people began the day in combat, to demand the immediate release of the Five, eight years after a docile and frightened jury declared them guilty of all charges, topping off the legal farce in Miami. Mothers, wives and other relatives of those courageous men attended the concert organized by the Union of Young Communists where, contrasting with the black flags of mourning on the Flag Memorial, white letters stood out spelling the words "Justice, Peace and Freedom."